We love segmented bracelets! 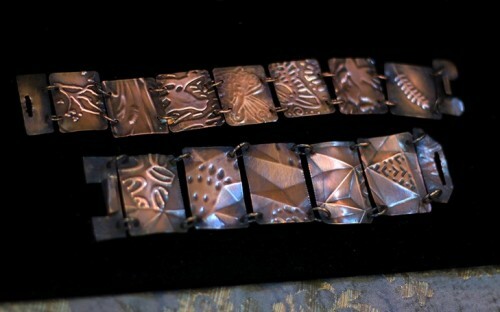 This class teaches you how by using copper panels of any shape – even free form, you can create unique bracelets. You will also learn how to make your own clasp which will add to the cachet of your beautiful bracelet. The techniques you will learn in this class are particularly valuable as they work in concert with others offered during this show. These are skills that translate to creating beautiful necklaces and earrings with or without stones as well. Intermediate skill participants welcome.